Welcome to InLoox PM Web App! 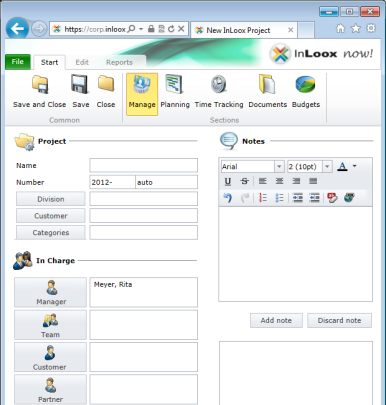 Here, you can learn how to start your first project with InLoox PM Web App. First, open a compatible Internet browser, such as the Internet Explorer or Mozilla Firefox. Please make sure that you have a connection to the Internet. 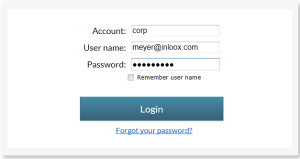 Enter your InLoox PM Web App address. Please make sure that you have your access data at hand. You will need your user name and your password. If you use InLoox PM Web App in combination with InLoox now! you will also need the name of your account. Then, enter your access data and click Login. Complete the displayed Manage form with your project data. Getting started with InLoox PM Web App - InLoox • Copyright 1999-2019 © InLoox GmbH. Tutti i diritti riservati.